The 7th Annual Horrible Imaginings Film Festival Will Offer a Virtual Reality Experience! Southern California's Horrible Imaginings Film Festival is including the latest in horror film innovation—the Virtual Reality Experience—throughout the five-day festival, September 7th – 11th, at The Museum of Photographic Arts in Balboa Park. Festival guests will have many opportunities to plug into the VR headgear between film blocks or during breaks. The VR in question, a horror experience called "Burlap," was directed by Justin Denton, who also directed the "Beware Crimson Peak" VR Experience for Legendary Entertainment. "As soon as I finished that and realized the emotion and fear I could create in VR, a light bulb went off in my head," Denton said about the project. "And I just knew I had to explore the world of Burlap in the VR space." Horrible Imaginings Film Festival will focus on VR as a separate medium, rather than as an alternative to traditional cinema. To highlight this point, the traditional short film version of Denton's "Burlap" will also screen during the "Human Killer & Psychological Terrors" Short Film Block on Sunday, September 11th. "We believe virtual reality is an experience that is altogether different from that of traditional cinema," Rodriguez said. "With both VR and traditional versions of 'Burlap' in the festival, we will be able to offer an exploration of the strengths unique to both mediums." What can people expect from the "Burlap" VR Experience? "To answer that might give too much away," Rodriguez said. "But rest assured, you have never experienced anything like it! This is a whole new level to exploring darkness! Horrible Imaginings has always looked to various traditional art forms to expand and elevate how we view the horror genre--now we are looking to include the latest innovations in cinema, as well!" DFF: Your new project, Rock, Paper, Scissors - what’s it about, tell us how did the project came together in the first place and what led it to where it is now? DB: This project started as an image - a couple staring at each other in horror as they are bent over opposing arms of a couch. From there, I put together an outline and began the process of the story. I recruited a new writer and dear friend, Josh Lee, to help. I originally thought that he could help give a unique voice to one of the main characters but I soon realized that he would invaluable in the creation of the finished script. I brought in Keith Collins and Ashley Steele (both of whom I had collaborated with successfully) to help produce and got Cory Green involved to give it the look we wanted. We are 80% shot and we will keep the team together to shoot for a couple fall weekends. After that, the edit will take up the better part of the winter. DFF: You have worked on many films. Some of which have had great success (Waltzing Anna, Mail Order Bride) how do you compare them to a project like Rock, Paper Scissors? DB: This is the first film for me that is in my control. I do have partners in Josh, Cory and Keith but I realize that it is truly the first time I have final say on everything. I am by no means a dictator but this project is the one that I have the most control over. In the past, I have directed pieces written by others (most notably the brilliant Joe Pepitone) or had others direct things that I had written. I have also had things produced by other teams as well. This one falls on me and I am thrilled with the team around me. DFF: You have also worked with many talents such as Oscar Award Nominee Danny Aiello, Artie Lange, Vincent Pastore & Emmanuellle Chriqui. Tell us about the cast of Rock, Paper, Scissors. The audition process and how you chose your ensemble cast to bring your project to life? DB: I have been very lucky to work some amazing actors. This particular film was cast mainly with actors that I had a relationship with. It is heavy subject matter and I wanted to be able to push a few boundaries. I find it easier to go to extremes with people that have built in trust. I was fortunate to cast the leads through a rigorous audition process and I could not be happier with the result. DFF: Your production team are no strangers to the field, Cory Green, a talented editor & cinematographer has had an Emmy nomination, Keith Collins is a multi award winning producer & actor who has a legnthly filmography seems like you couldn’t be in greater hands as far as production. How do you feel about the future of Rock, Paper, Scissors with strong people like Collins and Green behind you? DB: I have now collaborated with these two on multiple projects in different capacities and we have developed a relationship that extends beyond the set or the editing suite. I can happily call these two my dear friends. We know each other and we know how and why we do the work. I have no doubt that RPS will be our most successful team-up yet. DFF: Besides Directing and Writing, you have also acted in many films yourself which have garnished worldwide distribution such as The Meat Puppet, Gravedigger, The Jersey Devil to name a few, as an actor how do you feel that can translate to make you a better director for Rock, Paper, Scissors and future projects? DB: I feel my best asset as a director is my experience as an actor. I can relate to actors on their level and recognize that they are not machines able to produce time after time. I love acting and I have great respect for those that do it well. DFF: Speaking of acting, You star in the upcoming films Clean Cut and The Samaritans. Tell us about your characters in those films and if they helped you make better directing decisions for Rock, Paper, Scissors? DB: Luckily for me, acting on projects with talents like Keith, Cory and Joe Pepitone make the process enjoyable. Clean Cut was such a blast! My character was so well written by Joe and he gave me the opportunity to ad lib a bit so I really felt tied to the creation of that character. Joe is such a generous director and my co-star, Michael Billy was so funny that this ranks as one of my favorite roles. The Samaritans was an intense short shoot with Cory, Keith and two wonderful actors, Timothy Harrison and Annelise Nielsen (both of whom are in RPS). That was a rewarding experience in which I tried to wear the additional hats of writer and director. There is no way I could have pulled that off without the team surrounding me. It helped me grow as a director specifically because it strengthened the key relationship between me (as director) and Cory (as DP). DFF: You directed and acted in The Samaritans as well as Rock, Paper, Scissors. Explain how you were able to do both, the process of breaking it down as an actor/director without compromising focus from one or the other? DB: The Samaritans was such a challenge. I was only able t do both with the help of Keith and Cory. I performed many scenes as an actor and just had to trust Cory that we got we wanted. We did not have the time for me to watch every playback. Trust is a key element to any indie production, especially one like The Samaritans, which was super small. RPS acting was a bit easier. I had my co-writer, Josh Lee on set so he became my eyes. Once again trust became the main factor to our success. I would never have been able to do both without the help of this team. 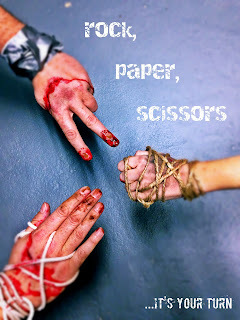 DFF: Any insider information on possible release dates for The Samaritans and Rock, Paper, Scissors? DB: We will be editing both projects this winter. We may have both ready to go at the same time. If that's the case, we will target a different set of festivals and distribution options. Our target is Spring for decisions on both. DFF: You have also been in many theater productions. Tell us the difference between theater and film and what have you learned from your experiences on stage? DB: I adore my time on theater. The biggest difference for me is the immediacy of theater compared to the lasting images of film. The on-the-spot reactions to theater are uncompromising. As an actor, you get an energy from the audience affirming or doubting your performance reality. I will continue to explore the opportunities on stage that I have been lucky to get. With film, you get to craft a performance in ways to that involve more trial and error in the moment. If a take goes awry, you can fix it or try something new. You need different kinds of stamina for each as well. Long rehearsals and research challenge a stage actor to explore and conserve your energy. Film acting stamina is put to the test on long shooting days and repeating takes. DB: I am working with one of my producers, Ashley Steele on a couple shorts that she is producing, including Wasteland. She is also co-writing a feature script with me that is a break from the dark subject we been dealing with. Ocean Grove is a romantic comedy which explores relationships ending and beginning in the context of a quirky Jersey beach town in the off season. DFF: What can you tell us about the career of yours, what got you into directing,acting,writing and did you receive a formal education on the subjects? DB: I studied theater and education at Montclair State University after a couple years studying TV production at Ithaca College. I also graduated from Connecticut School of Broadcasting (where I also taught). I started a Masters in cinema when I first started getting jobs in the world of film. I decided that I was learning more on the job from the professionals. Most of what I do now I learned from the people I worked with when I was younger. I have been lucky enough to be in the company of great actors (Kevin Carolan, Alysia Reiner), great writers (John Wooten, Jason Grote) and directors (Mare Carolan, Vincent Borelli). DFF: How would you describe yourself as a director,writer and actor? DB: I think I am decent at all three but I have the most experience as an actor. I am still learning something every time I work on a new project. I teach full time at a performing arts school and I learn form my students every day. They definitely make me better all three. DFF: What Directors, actors and writers inspire you? There are so many that have had an influence on me growing up. DB: There are a few that stood out to me. Kevin Smith was the first "local" that made a movie in my county in Jersey and was the first that seemed like me - just a normal guy from NJ. I never met him but There were plenty of people I knew that knew of him and it was something that stuck with me from the beginning. The first person I knew that produced, wrote, directed and starred in his own film was Vin Diesel. We had worked together for Mattel and he told me he was going to make this short film. A year later, we worked together again and he invited me to the screening of Multi-Facial. I was blown away that I regular person did this. It was always other people that made movies. Those two very different guys had huge influences on me as a young wannabe filmmaker. DB: I tend to gravitate to films of the 70s. Being a beach kid, Jaws was especially interesting to me. I can also watch any Cohen Brothers movie over and over, Blood Simple is my current favorite. I get asked by my students the question: what is your favorite all time film? I consistently have the same answer: The original Willie Wonka. Gene Wilder is mesmerizing and I still believe it is a flick that has everything. I am also a huge horror fan and for RPS, I revisited some of my old faves like I spit on Your Grave and Last House on the Left. DB: As a follow up to your theater question, I would like to mention the theater company that I am a part of, La Strada Ensemble Theater. I have been able to write, direct and act in original productions in the Jersey Shore center for arts and culture. Asbury Park. This town is growing a local arts (and specifically film) community that will hopefully rival bigger cities as more and more artists recognize the energy down here! DFF: Thanks for the interview with us Doug! DB: Thanks so much for this opportunity! I really appreciate any attention paid to our little flicks! !